One of the most influential bread books of recent times (I have to be careful saying that – it was first published in 1985) is Carol Field’s The Italian Baker. It’s the sort of book you could spend a lifetime working your way through. 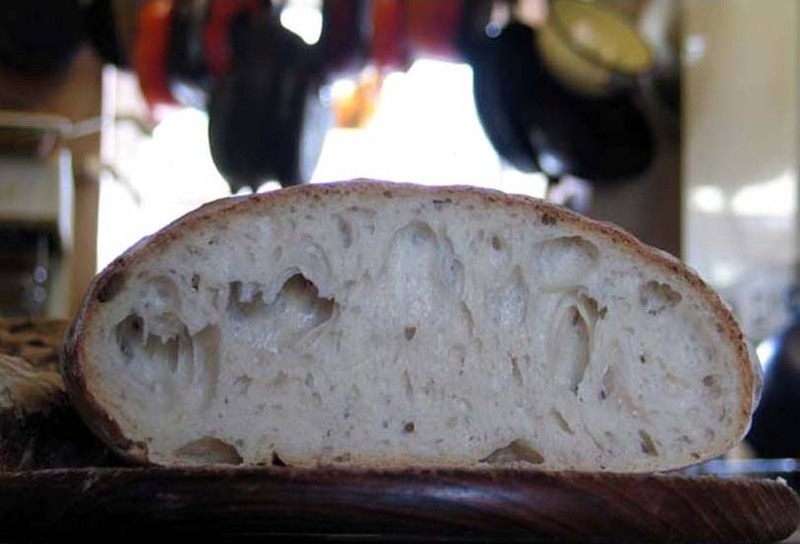 One of the most useful lessons I learned from it was you can convert these recipes back to sourdough. She didn’t tell you how to do it but, if you like, she gave me the go-ahead to start experimenting. This recipe originated in that book but I’ve been modifying it for so long you wouldn’t know it. I think I’ve finally got it right. If you’re not used to handling wet doughs this can be a little scary: flour your hands and the work surface well and work quickly. Use your dough scraper for folding and to free the dough when it sticks. Mix at 2 for eight minutes – I wouldn’t attempt this by hand. Pour (I said it was wet) onto a well floured bench. Sprinkle with flour and, using your scraper, fold it a few times into a roughly elongated shape. Sprinkle with flour again. The next part, which is a variation on the folding and stretching technique, will seem impossible but be brave and do it. With floured hands, roll up the dough towards you. Then, using your scraper, turn it through 90° and roll it up again. Don’t worry about it being rough and ready; it will get easier. Repeat a couple of times, form into an approximate ball on the floured bench, sprinkle with flour, cover and leave for an hour. Repeat the rolling up process and again at the end of the next two hours. After a total of four hours rising time, cut the dough into two. It will by now have developed some structure and you will be able to form them into very soft boules. Place them on heavily floured pieces of baking parchment. Flour the tops, cover and allow to rise for about 3 hours – until the dough starts to retain a finger mark. Sprinkle the tops with flour and dimple the loaves with your fingers all over, outwards from the centre. Be quite firm to flatten them and redistribute the gas bubbles throughout the dough without deflating loaves. Immediately flip the loaves over onto baking sheets. This can also be a little heart-stopping the first few times you do it, but have courage. 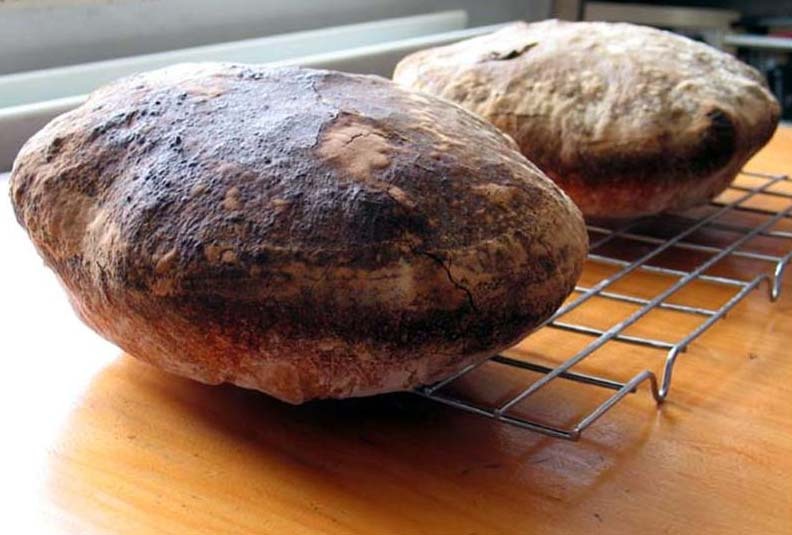 Peel off the parchment – if it sticks a little it will just make your loaves look slightly more rustic. Bake in a pre-heated oven at Gas 9 (475F, 240C) for 50 minutes. You may need to reduce the heat but you want to achieve a thin, crackling slightly burnt looking crust and the very wet dough needs time to cook through. I hadn’t made pane pugliese for years because it doesn’t fit into my professional baking routine where everything needs to as uncomplicated as possible. But Gert, who orders bread for Oren, his eclectic and ever-changing restaurant in Caernarfon (one year old next week and already in the Good Food Guide) was having an Italian week and, as I was just baking for him one day, I thought I’d give it a try. Amazing how things change given experience. I wouldn’t now be bothered about mixing by hand and didn’t have a problem handling the dough (66% is hardly very wet). I didn’t bother using baking parchment as an aid and it didn’t take courage turning the dimpled loaves onto the baking sheet. Still makes fantastic bread though. Yeah, I’m with you on 66% hydration being not that scary, nowadays 🙂 Looks like a cracking good loaf that, I’m a big fan of that kind of bread! Can you email me a slice? Lol. Well, it’s only a few weeks til you come up to Bethesda for the Microbaking course – we’ll have a slice then. Mind, you’ll have to watch me. I was going to bake one with this week’s student and went and refreshed my starter for the main bake before I removed a portion for the Pane Pugliese! What hydration was the starter, Mick? Cheers Mick, looking forward to it!